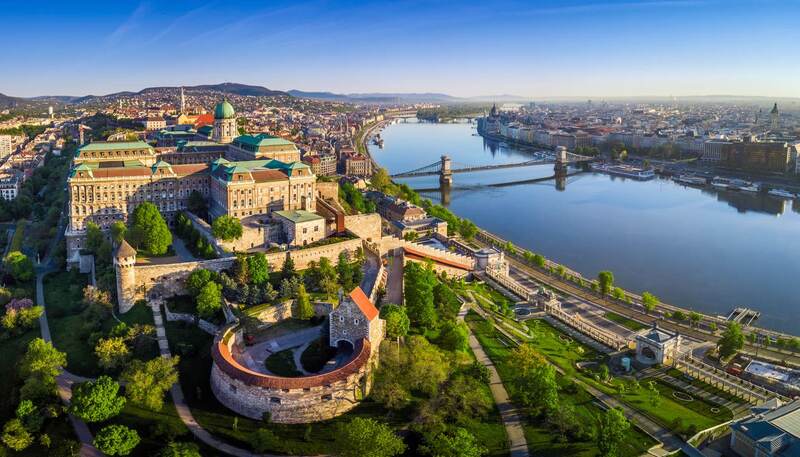 The union of two cities, Buda and Pest, has created a diverse European metropolis nestled on two sides of the River Danube, with lush green hills to the West and bustling urban flatlands to the east. From ornate bridges to the Gothic Revival style parliament and the cobblestoned Buda Castle, there’s a lot to take in when you visit Hungary’s capital city. But don’t worry, with century-old thermal baths to soak in and sightseeing boats to hop on, you’ll have plenty of opportunities to kick back and relax. Spring (March-May) transitions the city from temperatures of 5°C (41°F) in March to pleasant weather that approaches 20°C (68°F) in late May, making for a perfect time to visit. Summer (June-August) pumps heat waves through city streets with highs that reach the dry temperature of 30°C (86°F) so be prepared to sweat both in and outside of the city’s thermal baths. August is a popular time to visit thanks to Sziget, one of the largest music festivals in Europe. Autumn (September-November) slopes back down to spring-like weather with average temperatures that chill to 4°C (39°F) by the end of November. Winter (December-February) or the least popular time to visit Budapest sees snow and thick fog with accompanying negative numbers that dip to an average low of around -2°C (28°F) in December. The Budapesti Kozlekedési Központ, or BKK, runs buses, four metro lines, trams and trollies throughout the city. Trams represent the bone structure of Budapest’s public transportation system. These little yellow lines crawl through main roads, offering budget-friendly access to various destinations across the city. Single trip tickets, 10-journey ticket packets and travel cards valid for one, three, or seven days are available for patrons looking to explore the city on a budget. Alternatively, the Budapest Card offers unlimited public transportation travel for up to 24, 48, or 72 hours in addition to free or discounted admission to multiple attractions. 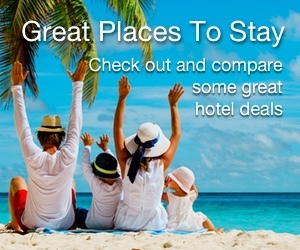 For cheaper taxi fares, book travel through a hostel or hotel front desk. Hailing a yellow taxi on the street isn’t out of the question, but unregistered taxis may trick tourists into paying higher fares than necessary. Check for the car’s required taxi sign, yellow registration plate, and running meter for an optimal experience. See how bike, car hire, and rental options work in Budapest by consulting our Getting Around Budapest guide. After marvelling at the mosaic of geometric rainbow tiles that make up the roof of Matthias Church’s on Castle Hill, head to the off-white structure adjacent to its backside for the best views of the city. During the Middle Ages, the defence of this castle’s wall was left to the guild of fisherman in the Middle Ages, hence the name. Today, Budapest is a thriving metropolis full of paprika sausage and spas, but the city has a darker history of oppression from fascist and communist regimes. The House of Terror museum acts as a memorial to the victims of these authorities, with exhibits that educate visitors on the nation’s relationship with Nazi Germany and the Soviet Union. Reflect in silence and listen to interviews of the survivors that lived through these tumultuous times. Soak in the largest medicinal bath in Europe with hundreds of other relaxed spa-goers in the yellow framework of cheerful New-Baroque architecture. Said to alleviate joint pain and inflammation, the natural waters in this mammoth of a hot tub provide soothing warmth on the coldest winter days, and the environment allows for friendly chit chat among patrons wading through the clear, shallow water. Fill the time between a bath and museum exhibits with visits to Budapest’s other attractions, found in our Things to See in Budapest guide. For the more eccentric travellers, crawling through Buda’s underground caves makes for a great way to connect with nature. Take a guided tour at the Pálvölgyi or Szemlőhegy caves and worm through halls of ancient rock formation in subterranean cool air. The river that splits Buda and Pest provides plenty of boating opportunities for both party animals and couples looking for romance. Cruise slowly on a three-hour boat ride with a cocktail in hand, or opt for an adrenaline rush with an exhilarating speedboat trip. The latter is the fastest, and most exciting way, to take in the sights of Budapest. Plan unique escapades and book tours with the help of our Things to do in Budapest guide. Kolbász – sausage is an ever-present street-food in Budapest, and none are as iconic as these delicacies made of pork and a good dose of paprika. Nokedli – tiny dumplings made with noodle graters and boiled in hot water, this buttery starch compliments savoury dishes like goulash and chicken paprikash. Lángos – like pizza, but better. These fried dough saucers hold spats of sour cream, cheese, and a variety of other toppings. Töltött káposzta – meat and rice mixture stuffed in cabbage leaves and garnished with sour cream makes for a perfect meal on a cold day. 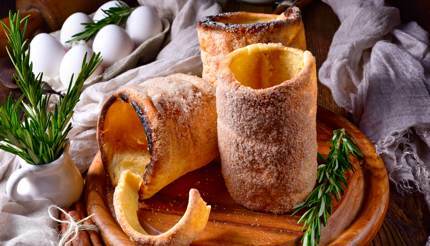 Kürtőskalács – a sweet cylindrical bread also known as “chimney cake” plastered with liberal amounts of sugar. Tipping: It’s standard to tip around 10% for good service. Consult our Budapest Food & Drink guide for more dishes to try and the best places to try them. 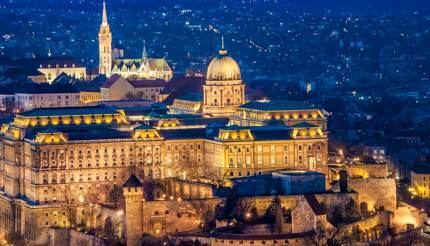 Budapest’s reputation as an ideal destination for both the backpacker on a budget and affluent travellers matches the city’s wide variety of accommodations. Luxury hotels like the Buddha-Bar Hotel and the New York Palace offer guests decoration that drips with modern and old-timey elements. While these pricey hotel rooms share central locations to city attractions, so do cheaper stays. 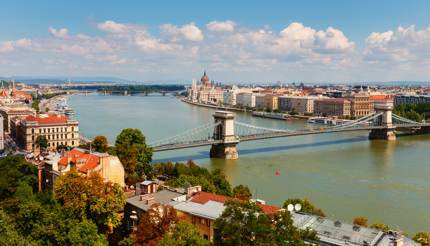 The economical NH Budapest City sits on the edge of the Pest side and offers quick access to bridges that connect to the more picturesque Buda. To see more hotel recommendations that fit your price point, see this Budapest Hotels guide. Famous for its clubs and ruin bars that deck out abandoned buildings, Budapest’s nightlife certainly has its own unique brand. Szimpla Kert’s touted popularity may be off-putting for some who wish to avoid tourist traps, but this bar is anything but overrated. The multi-storey abandoned building features graffiti-covered walls, antique furniture and a dance floor. Other ruin bars mimic this landscape, making it easy to get lost in the labyrinth of different abandoned structures. To see other ruin bar recommendations and suggestions for clubbing locations, see our Budapest Nightlife guide. Other than the UNESCO-listed Andrássy Avenue, the city’s shopping streets don’t necessarily cater to high-end designers. Instead, they harbour charming shops that sell a number of local goods and crafts. Find widely recognised brands and smaller stores in Buda and Pest, or check out the various markets that pop up on sidewalks during weekends with fair weather. 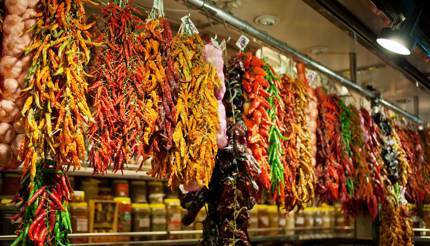 For a thoughtful souvenir, head to the Great Market Hall, which facilitates food and produce vendors, and pick up a pouch of paprika to remember your time in the city. Be in the know while shopping in Budapest by reading our Shopping in Budapest guide. American, Canadian, Australian, and British nationals should hold a passport valid for three months beyond their length of stay and issued within the past 10 years to meet entry requirements. EU nationals must only have a passport or national ID card valid for the duration of their visit. Find more information on the documents you need to visit Budapest with this Hungary Visa and Passport Requirements page.